At least six bombs have exploded in the heart of Indonesia’s capital city of Jakarta leaving 17 people, including five attackers, dead. The explosions, which struck near the United Nation’s Information Center in Indonesia, were accompanied by reports of gunfire at a Starbucks and Sarinah Plaza mall. Among those killed are seven civilians, five policemen, and five attackers. It remains unclear how many people have been killed. However, ABC’s Indonesia Correspondent tweeted that he could see at least two bodies while AFP reported at least three dead. Photographs meanwhile appear to show dead bodies near a police post on a main road. Others show damage near a McDonald’s and a Starbucks Coffee shop. Indonesia’s President condemned the attacks and said that Indonesia would never bow down to terrorism. 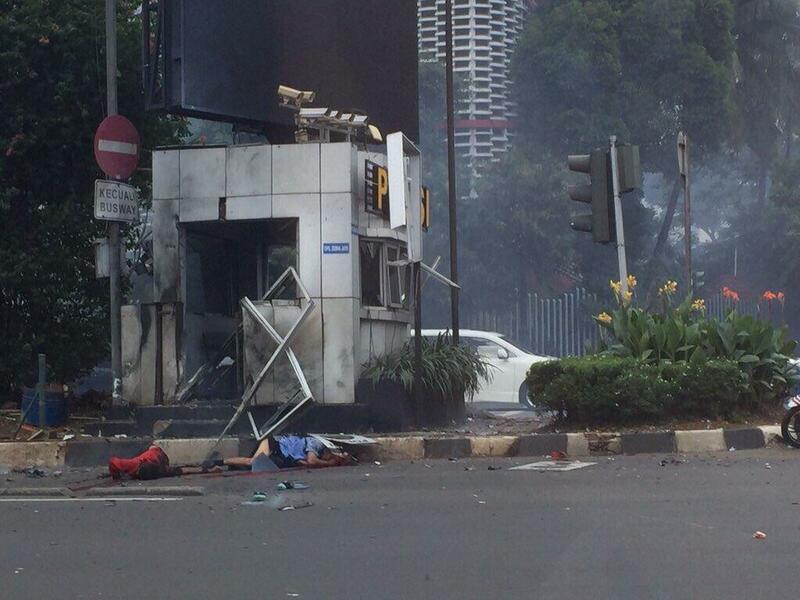 “I have received reports some time ago about the explosion in Thamrin street Jakarta. We express condolence to those who became victims, but we all also condemn the attack that caused restless among the community,” Indonesian President Joko “Jokowi” Widodo said.